Home > Used Vehicles > 2017 Kia Sorento SX,LEATHER,SUNROOF,NAVIGATION,BLUETOOTH,BACK UP CAMERA, FULLY LOADED!!!!! 2017 Kia Sorento SX,LEATHER,SUNROOF,NAVIGATION,BLUETOOTH,BACK UP CAMERA, FULLY LOADED!!!!! Cylinders: 3.3L V6 24V GDI DOHC - 6 cyl. 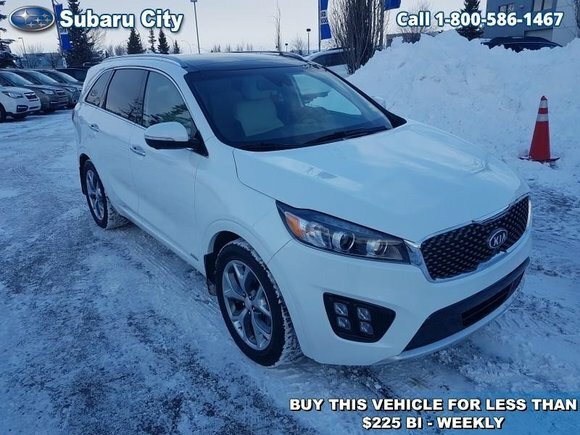 This 2017 Kia Sorento is for sale today in Edmonton. The 2017 Sorento has been redesigned with a wider stance and a longer wheelbase to provide a more versatile cabin. The Sorento has elegantly sculpted surfaces, more cabin space, and a wraparound dashboard for distinctive appeal. From finely crafted seating to intuitive advanced technologies, it's the car you drive to seek out adventure.This SUV has 53629 kms. It's snow white pearl in colour. It has an automatic transmission and is powered by a 3.3L V6 24V GDI DOHC engine. It has some remaining factory warranty for added peace of mind. Buy this vehicle now for the lowest bi-weekly payment of $220.72 with $3643 down for 84 months @ 5.99% APR O.A.C. ( taxes included, $790 Administration and Secure Ride included / Total cost of borrowing $7389 ). See dealer for details. Want to try the 2017 Kia Sorento SX?